Stay cool and be safe in the waters on the Fleurieu. There is a good reason why the Fleurieu Peninsula is South Australia’s most visited region - it is known as Adelaide’s playground. The Fleurieu Peninsula is undoubtedly a family friendly place, here are some of our favourite things to do. Say no more! Not only is Gemtree Wines a favourite McLaren Vale winery for adults, but children love Gemtree as well. The owners have created a family friendly cellar door, by adding a safe, entertaining playground in the beautiful surrounds on the winery. Read more about Gemtree Wines. Unlike any playground that most of us adults experienced as a child, Jubilee Park at Port Noarlunga is beyond incredible. Located near the Onkaparinga River in Port Noarlunga, Jubilee Park is easy to get to and only 45 minutes from Adelaide. Jubilee Park is a maze of wonderful wooden constructions consisting of multiple layers and levels for kids of all ages. Read more about Jubilee Park. 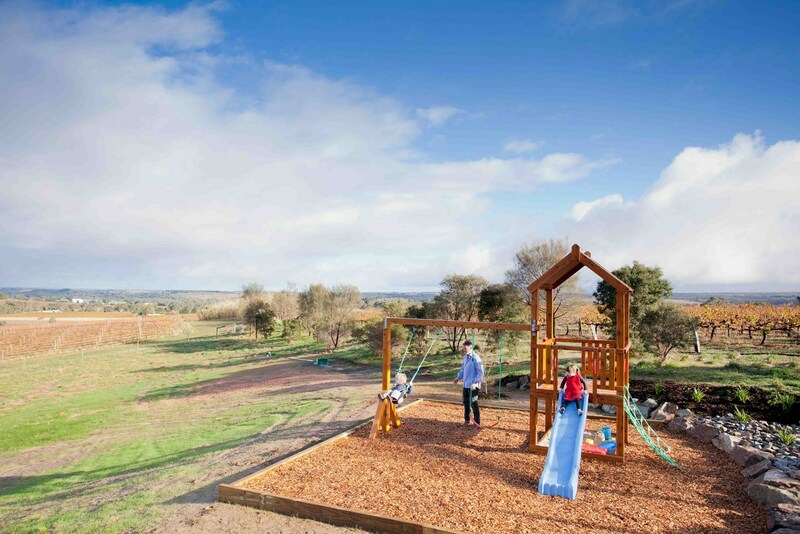 A new addition to all that Goolwa has to offer, the Nature Playspace at Bristow Smith Reserve is one not to be missed. 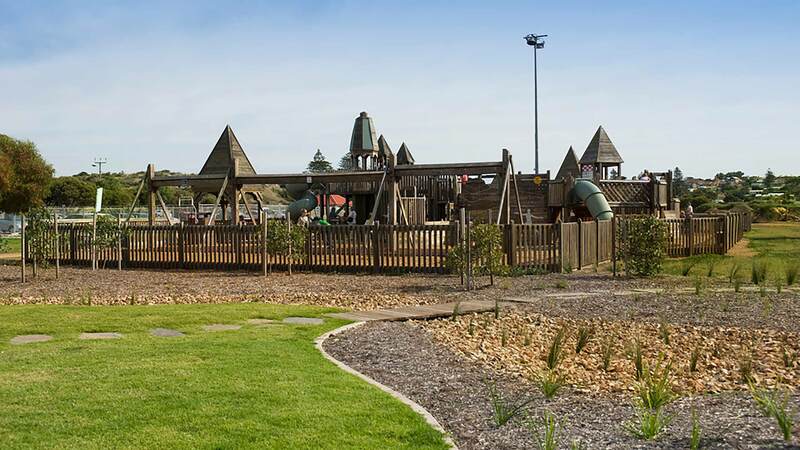 Just a short drive from the centre of town, located near the Goolwa Yacht Club and Aquacaf on Barrage road, your children will fall in love with the nautical themed playground near the water's edge. More information about Bristow Smith Reserve Nature Playspace. There is nothing more exhillerating than a Southern Bluefin Tuna whipping past you like a freight train in the waters of Victor Harbor, gently plucking a pilchard from your fingers on its way through. At Oceanic Victor, Families can get up close and personal with magnificent Southern Bluefin Tuna – one of the fastest fish in the sea! 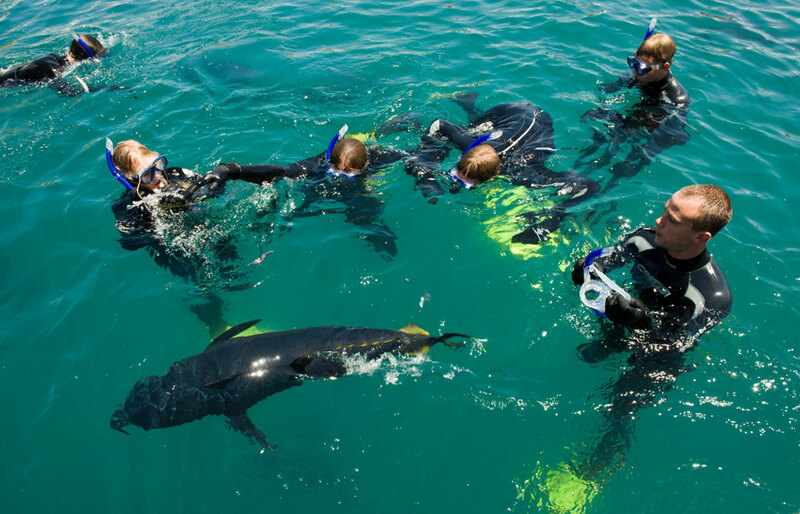 Or settle in to Oceanic Victor's undersea observatory and enjoy the spectacle of Australia’s marine life – all in the safety of a purpose built enclosure in the reach of uninhabited Granite Island. Read more about Oceanic Victor. Victor Harbor has always been a favourite holiday spot for people from Adelaide. Part of the appeal is the family friendly attractions such as the Horse Drawn Tram. Magnificent Clydesdale horses draw you along the causeway from seaside Victor Harbor to Granite Island. 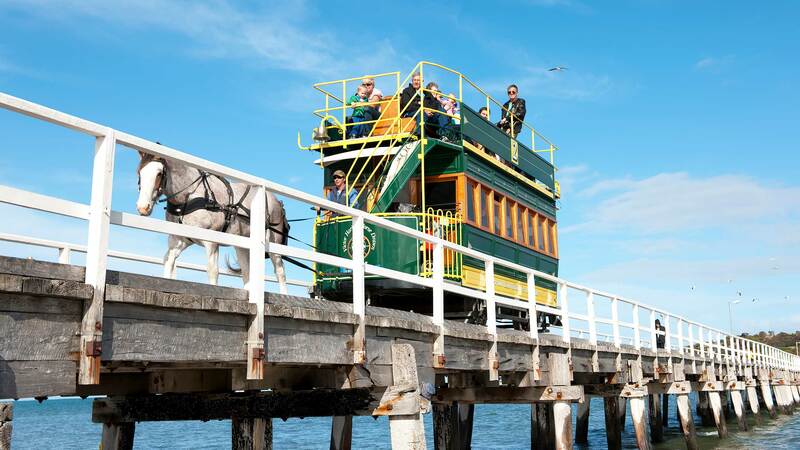 Read more about the Victor Harbor Horse Drawn Tram. The Cockle Train is based in Goolwa along the Wharf Precinct and operates along the oldest steel railway to Victor Harbor. 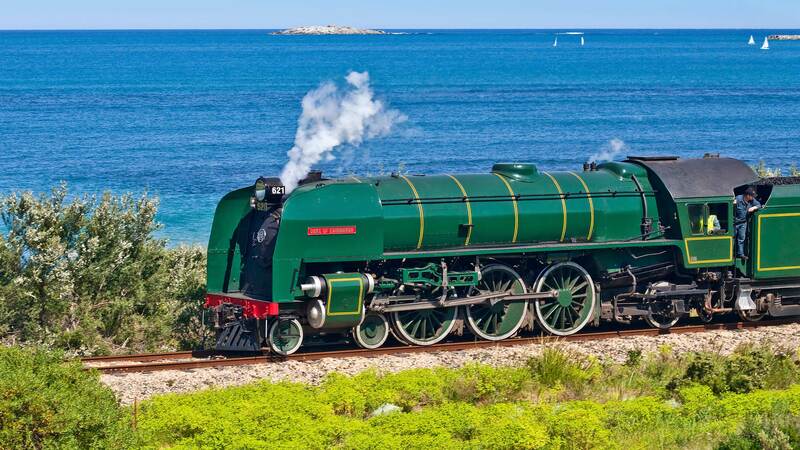 The Cockle Train climbs to the top of the coastal cliffs and passengers then experience some of the most picturesque coastal scenery. Read more about the Cockle Train. If you're kids are really into trains, pop into the Morphett Vale Railway for a ride on their miniature locomotives, it's a treat for young and old! Running times and more information about Morphett Vale Railway. We meant it when we said the Fleurieu Peninsula is Adelaide's Playground. With animal experiences galore you're kids won't want to leave! On the skirts of Victor Harbor is Urimbirra Wildlife Park. Home to many native animals, Urimbirra is an open-range wildlife park where you can feed the kangaroos, pat a koala and even watch a professional snake handler. Across the way is the Goolwa Animal Farm, where children can interact with animals of all shapes and sizes including alpacas, donkeys, mini-pigs, ducks, turkeys and goats. Lastly, what child doesn't want to have the chance to ride a pony? Narnu Farm is a farmstay in Hindmarsh Island where families and large groups can stay and experience farm-life, including riding an old restored Bedford truck, holding chicks, feeding the baby animals and those memorable pony rides! More details about Urimbirra Wildlife Park, Goolwa Animal Farm and Narnu Farm. If you are keen to see large mobs of kangaroos the Goondooloo Ridge Walk is a must. Pack a picnic, and take the family on a short and easy walk that explores Deep Creek Conservation Park. Along the way you will also enjoy great views of Backstairs Passage and the Pages Islands. Read more about the walking trails through Deep Creek Conservation Park. With so many great attractions and things to keep the family occupied, you won't be short of ideas for your Fleurieu Peninsula holiday.